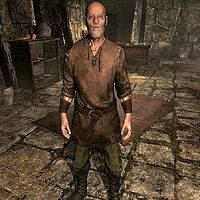 Esbern, an elderly Nord conjurer, is a chronicler and agent of the Blades who has survived the investigations of the Thalmor by hiding in Riften's Ratway. Long obsessed with the foretold return of the dragon Alduin, the World-Eater, Esbern serves as your mentor, guide, and advisor. Despite this, once he learns of Paarthurnax's existence, he will demand that you slay him and will refuse you any aid until you have done so. Esbern wears miner's clothes initially, but changes into mourner's clothes once you reach Sky Haven Temple with a pair of boots, and carries an ebony dagger and a selection of lower-class items and gold. In combat, he relies on mainly Destruction spells, and occasionally summons leveled atronachs. Esbern: "I used to dream of it. In the dream, I was standing… someplace high up… a tower, or a mountain. It was always just before dawn. The whole world was in darkness. Then came the flash of light – just on the horizon, within the clouds that mark the border between worlds. It could have been lightning, but there was no thunder. In the dream, the sense of foreboding grew, but I could never wake up. Then it came again, this time more distinct. Closer. Definitely not lightning now. It was orange – brilliant orange, the color of hearth and dawn. And a sound, too. Distinct and indistinct. Not thunder… something else. Something I should recognize, but in the dream I cannot place it. I want to leave my high place, to seek shelter. From what, I don’t yet know. In the manner of dreams, I cannot escape. I’m forced to wait and watch. Then, finally, realization and horror arrive together. The orange is flame, heat. The sound a roar, a challenge in their ancient tongue. But now it’s too late for escape. The dragon is upon me – fire and darkness descending like a thunderbolt. And not just any dragon, but the Dragon – Alduin, the World-Eater, the dragon who devours both the living and the dead. And then I would wake up. And hope that it was just a dream… but know that it was not." If you have not started any quests involving him, he will simply open the porthole and tell you to go away, promptly closing it afterwards. After arriving at Sky Haven Temple, Esbern can grant the Dragonslayer's Blessing which gives a 10% increased Critical Hit Chance vs. dragons for five days. Esbern is voiced by Max von Sydow. He can be a very useful follower. After you free him from his cell during A Cornered Rat, he will be an invincible follower, and will remain so as long as you avoid Delphine (and therefore Riverwood). Alternatively, you can take him to Delphine and have them both follow you for two invincible followers. You may also have a regular follower with you. When you first meet Esbern during A Cornered Rat as part of the main quest, sometimes his voice will be missing and/or he doesn't answer the door. Visit this page for details and possible solutions. After arriving in Sky Haven Temple, Esbern may not engage in the correct dialogue to activate or complete any of his quests. If you tell Esbern to wait somewhere, he may disappear when you return for him. He can sometimes be found in Riverwood (waiting to engage in conversation with Delphine), in Riften, or traveling the road. After being escorted to Sky Haven Temple, Esbern might appear wherever you fast travel. To fix this, you must unpatch your Skyrim game. It only appears on patch 1.5 and after the Alduin's Wall quest. After completion of the quest Dragonslayer, Esbern may randomly be found wandering dungeons. ? Esta página foi modificada pela última vez à(s) 19h42min de 14 de dezembro de 2015.